The little-known SF State cycling team has been happy to play the role of underdog, having one of the smallest teams to compete in the state. The team isn’t letting their small size diminish their expectations, however, racking up a series of impressive victories over the last few weeks. James Enright, vice president of the SFSU Cycling Team, co-founded the cycling club as an offshoot of the Triathlon Club at SF State last year. Thanks to Enright’s organizing and management, this year the team was able to pull together enough funds to purchase biking jerseys. “Before this year, (the team) would have shirts with some duct tape on the chest and back with (the team member’s) name on it,” Enright said. The team, in just its second year of existence, took some notable spots on the podium at UC Santa Cruz’s Slugfest over the Feb. 23-24 weekend. All members who competed at UCSC came in the top ten. For some of those members, it was their first time partaking in a competitive race. Enright took second place at Santa Cruz in the road race in the Men’s A division, behind Stanford, but ahead of the University of Southern California competitors. This is a great accomplishment for SF State, which has the smallest team in the state’s D1 division of collegiate cycling, according to Enright. But the victories didn’t stop there. In the Women’s C road race, Nici Rahsom came in fifth and Vicki Tran came in ninth place. Yao Saetern placed sixth in the Men’s C division for the criterium race. Christian Lam came in second place for Men’s D criterium, and Gasmin, first-time racer, placed seventh. “It was tons of fun. I’m hooked on it,” Gasmin said. There were also several notable achievements outside the top ten. In the Men’s B road race, Dominic Bati came in 24th. In the Men’s C road race, Saetern placed 23rd. In Men’s D road race, Bryan Banducci came in 13th. The course in Santa Cruz was unusual in that it was more “spectator-friendly” than road races usually are. Enright recalls “fans screaming on the sidelines.” Unlike most road races, the course was limited to the boundaries of the UCSC campus, which made it easier for supporters to cheer on the cyclists. “We are just looking forward to having a good time,” Tran said before the race. The team also placed in the top ten at Stanford over the weekend of March 9-10. In the road race Saturday, Lam placed sixth in the Mens C division and Bati came in eighth. Cyclists from SF State also made it to the top ten in the criterium race Sunday. Enright placed second in the Mens A division and Saeturn came in third in the Mens C division. With only eight members, SF State’s is “one of the smallest teams out of the division-one schools,” according to Enright, and the team is actively looking for new recruits. The team welcomes people who are interested in competing, people who simply want to tag along for group rides and people who are interested in doing both. Gasmin agreed with the team’s relaxed approach to cycling. “The majority of our team is people who are relatively new to it. It’s not really a try out,” Gasmin said. 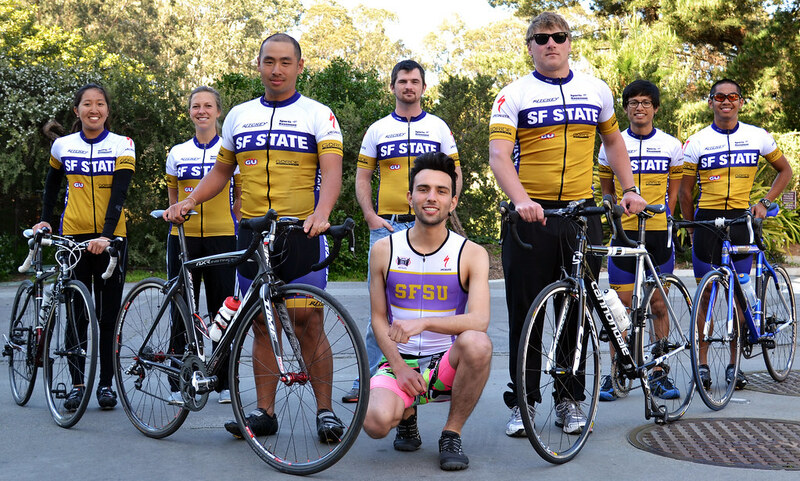 For more information on the SF State cycling team, visit their Facebook page, or email the Cycling Club or Triathlon Club at sfsugatorcycling@googlegroups.com or gatortriathlon@gmail.com.